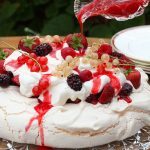 The combination of crunchy meringue, soft whipped cream and scrummy berries make this summer berry pavlova is seriously hard to resist. 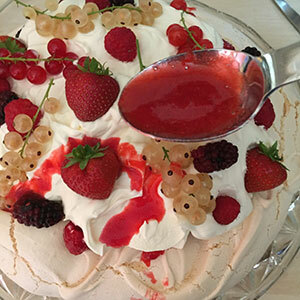 A pavlova is a spectacular centrepiece making it perfect for entertaining. 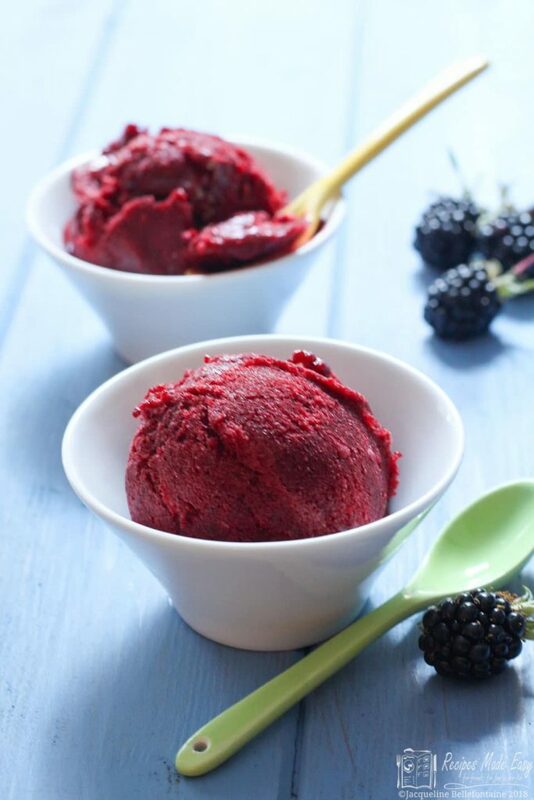 Whether you use a mixture of different berries or stick to just one or two of your favourites, it always has that “wow” factor. 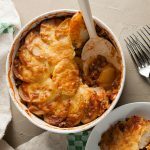 As a result of all the soft fruits on the allotment being ready for the picking, a lot of my recent recipes have a sweet bias, and this one is no exception. 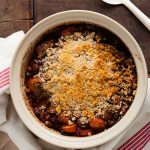 Although I promise to redress the balance soon with some more savoury recipes made easy, it would be a shame shame to let the berries go unused. It’s amazing what a patch of just 3 x 4m can produce: last week the raspberry bushes were just beginning to produce more than just the odd one here and there; an early blackberry was just beginning to fruit; there were still a few red and white currants left on the bushes; and the last of the strawberries were ripe. 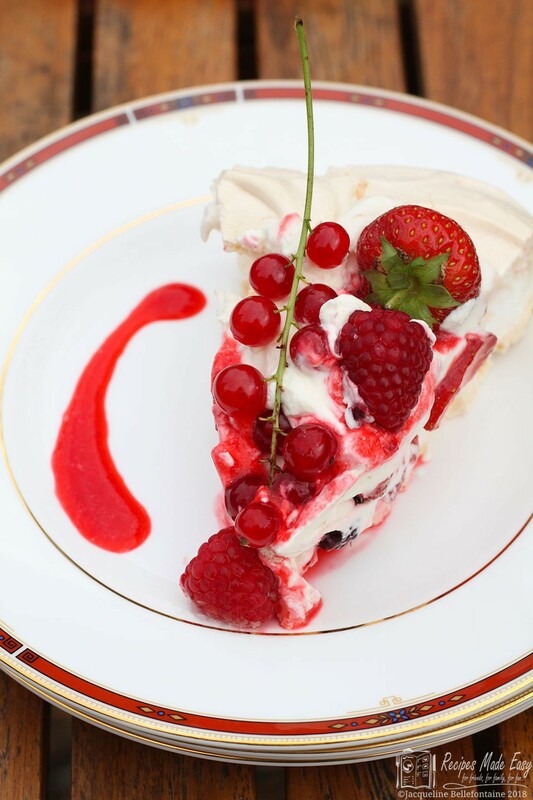 While picking them I considered how to show them off and, after some thought, I settled on a summer berry pavlova. Keen readers may notice that the backdrop of the pictures looks different this time. That’s because we took the harvest with us when we visited a friend for the weekend and made the pavlova there. The main pictures were taken in her garden and if you look closely you may even be able to spot a few redcurrant hanging on the bushes behind the table. Crunchy meringue with a chewy centre, topped with fresh berries and whipped cream make this a decadent and delicious dessert dish. Preheat the oven to 150℃ /130℃ fan/gas mark 2. Draw a large circle on a sheet of non stick baking parchment using a dinner plate as a guide. Turn the paper upside down (make sure the circle is dark enough to show through the parchment) and place on a baking sheet. 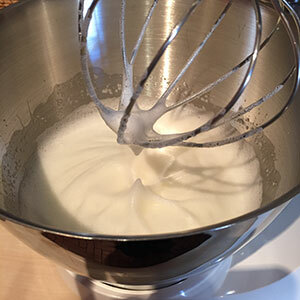 Whisk the egg whites until standing in stiff peaks, then gradually whisk in the caster sugar a spoonful at a time until all the sugar has been added and you have a stiff glossy meringue. 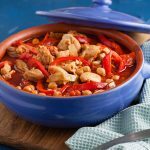 Sprinkle the vinegar and cornflour on top and whisk in. Spoon the mixture onto the centre of the parchment and spread out using the drawn circle as a guide. Make a dip in the centre and swirl the meringue in a mound around the edge of the circle. Bake in the centre of the oven for 1 hour. 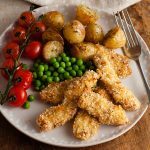 Turn off the oven and allow to cool completely in the oven without opening the door. Push the raspberries and redcurrant if using through a sieve into a bowl and discard the seeds. Stir in the caster sugar and set aside. Hull the fruit if required. Cut larger strawberries into quarters or halves. Set aside some fruit to decorate. Toss the remaining fruit in a little coulis. Spoon the coated berries into the centre of the pavlova. Whip the cream until standing in soft peaks and spread over the berries. Arrange the remaining fruit on top. 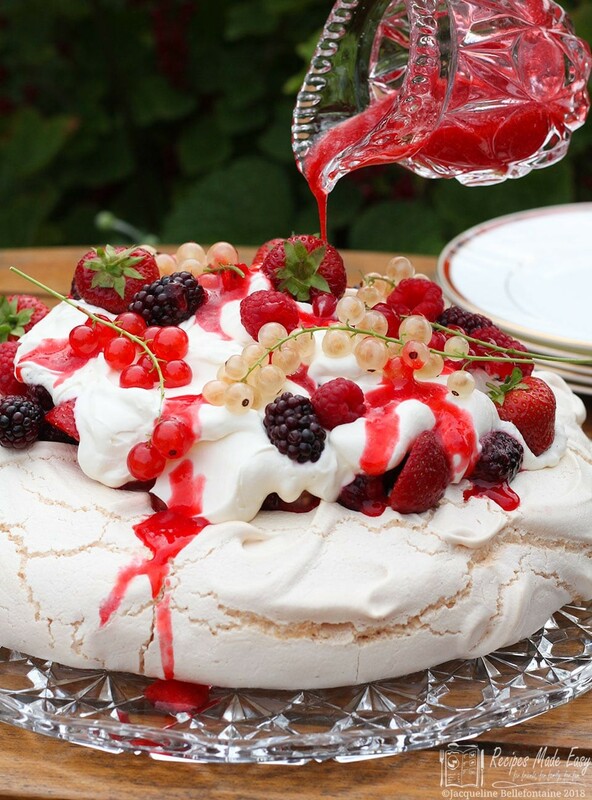 Serve the remaining coulis, drizzled over the top of the pavlova or separately. The meringue will keep in an airtight container unfilled for several days. Assemble just before serving. Gradually whisk in the caster sugar. Continue whisking until you have a stiff glossy meringue. Spread out on a baking sheet to form a large circle and make a slight dip in the centre. Mix the berries with a little of the coulis. Pile in the centre of the meringue. Arrange some more fruit on top. Serve with the remaining coulis. I’ve used a selection of berries because that is what I had available, but you could stick to just one or two. I make my coulis with raspberries as they are soft enough to easily push through a sieve. 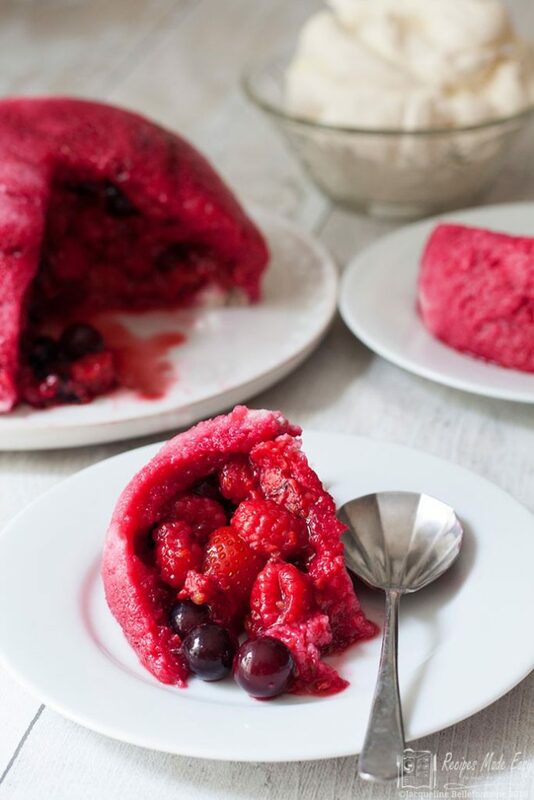 A handful of redcurrant added to the raspberries add an extra flavour dimension. 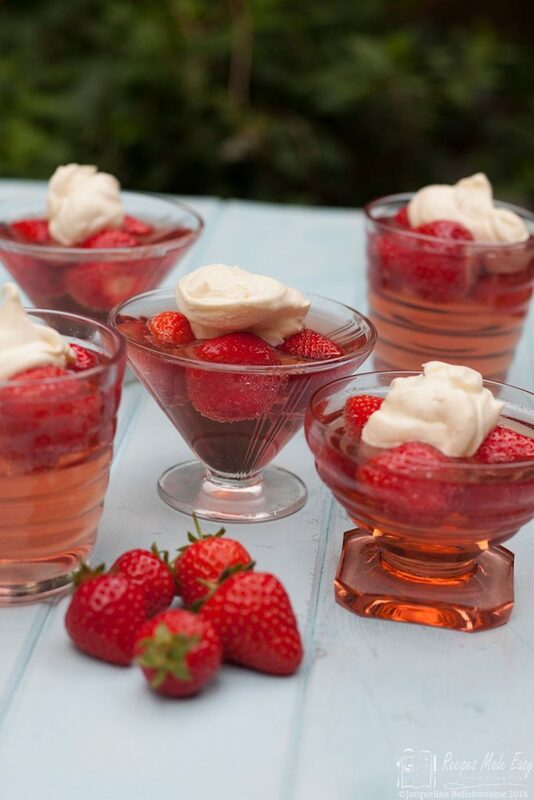 If you make the coulis from strawberries instead, you will find it easier to blitz them first. This is a dessert for a special occasion so I like to use all cream, lightly whipped until it just holds its shape. For a slightly lighter cream topping, substitute some of the cream with natural yogurt. 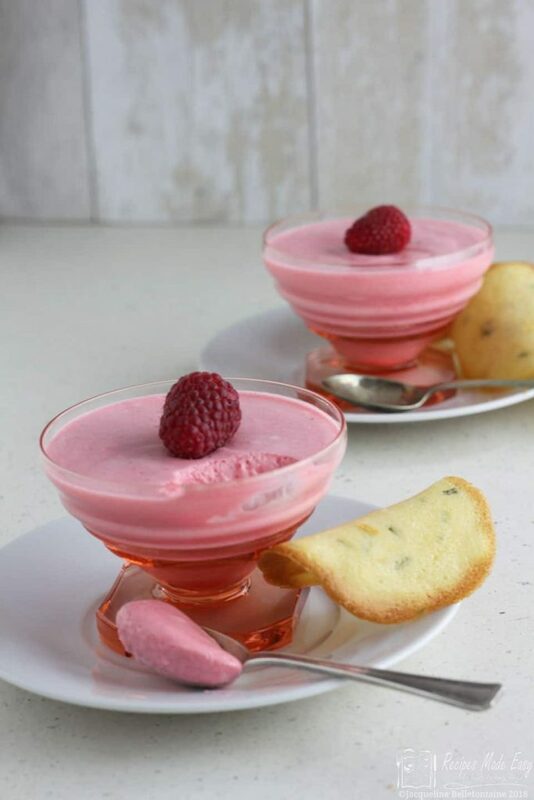 Whip the cream until standing in soft peaks then gently fold in the yogurt. The meringue can be made a few days ahead of time if stored in an airtight container. 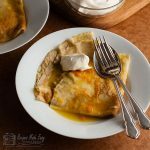 The coulis can be made the day before and kept in the refrigerator. 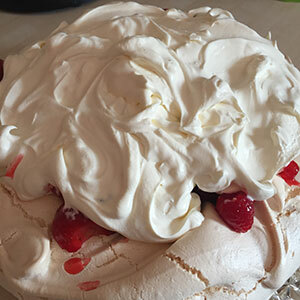 For the best results assemble the pavlova just before serving. Oh wow Jacqui, your summer berry pavlova is a real show piece. The perfect dessert when you don’t want anything too heavy. Delicious. 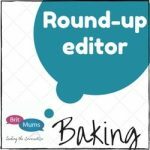 🙂 Commenting as BritMums Baking Round-up Editor. Thank you Julie. 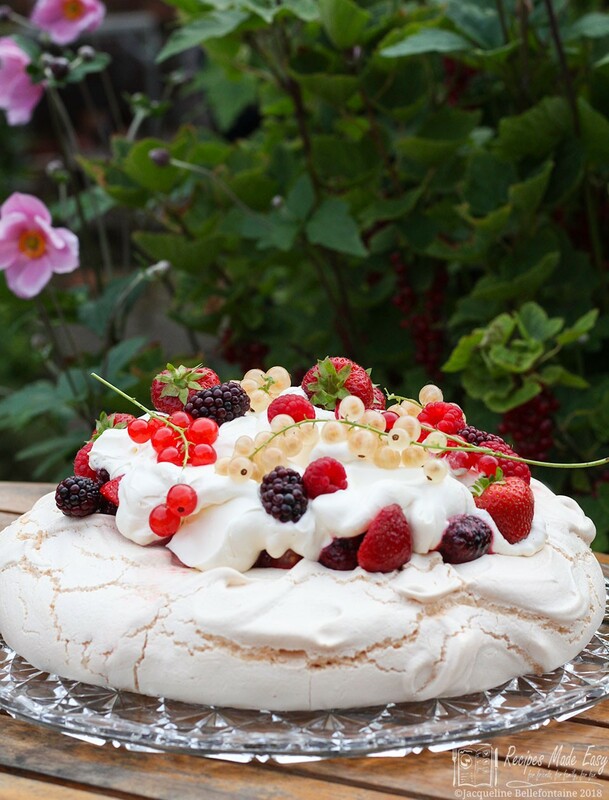 Its hard to resist a pavlova especially when covered in beautiful berries isnt it. Ooh this looks so inviting Jacqueline with those beautiful newly harvested berries. Pavlova has me everytime, it’s certainly one of my favourite desserts. Thank you Mandy. 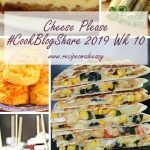 Pleasure to link up to #CookBlogShare. To my mind anyone who deosnt like pavlova has to be a bit odd:) It’s a delicious treat once in a while.